The Leelanau Trail officially extends from Carter Road in the Greilickville area of Traverse City to Dumas Road on the north side of Suttons Bay. 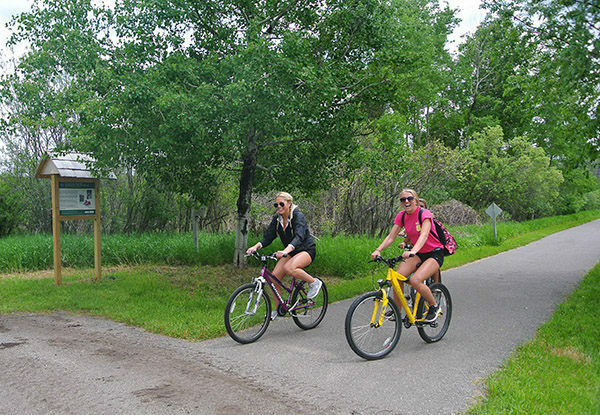 For many, the trail is a 14-mile ride from the Cherry Bend Trailhead to the trailhead at First and Cedar Streets in Suttons Bay, where riders can park their bikes and walk to almost a dozen restaurants and cafes. The Leelanau Trail dates back to 1903 when the Traverse City, Leelanau & Manistique Railroad completed the line to Northport as part of a new car ferry service across Lake Michigan to the Upper Peninsula. The Leelanau Scenic Railway was the last to use the rails. After the service ceased operations in the early 1990s, the Leelanau Trail Association (LTA) was formed in 1994 to purchase 15 miles of rail corridor from Traverse City to Suttons Bay. Almost immediately there was heated opposition by property owners leading to numerous court cases over the proposed trail. But LTA volunteers forged ahead and by 1997 had paved more than four miles of the trail at its north and south ends and established a large trailhead on Cherry Bend Road. The following year, TART Trails, Inc. was formed and took over the administration of several regional trails, including the Leelanau. 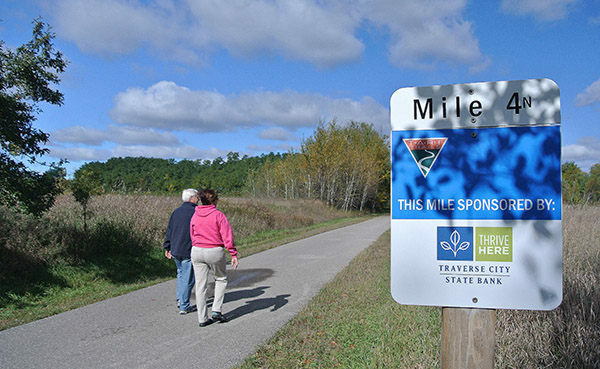 In 2004, the Leelanau Trail was connected to the TART Trail that extends 11 miles to the east through the heart of Traverse City. By 2014, when the Leelanau Trail had become a fully paved, off-road connection between Traverse City and Suttons Bay, winding past picturesque farms and vineyards, forests, lakes and ponds, there was no denying its overwhelming popularity. The Leelanau Trail officially extends from Carter Road in the Greilickville area of Traverse City to Dumas Road on the north side of Suttons Bay. 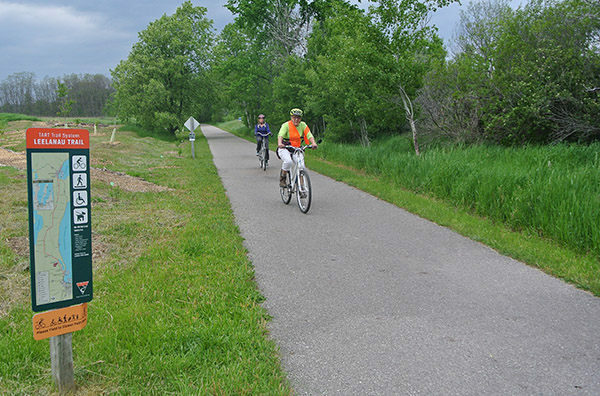 For many, the trail is a 14-mile ride from the Cherry Bend Trailhead to the trailhead at First and Cedar Streets in Suttons Bay, where riders can park their bikes and walk to almost a dozen restaurants and cafes. After refueling and reviving, it’s a ride of less than a half mile to the BATA stop for the bus back to Traverse City. From the The Cherry Bend Road trailhead at Milepost 3, the Leelanau Trail heads north along the west side of Cedar Lake. The best chance to view the lake is at the DeYoung Natural Area just beyond Milepost 4. The trailhead includes a hand pump for drinking water, an edible trail garden and a trail of less than a quarter mile to a fishing pier on the lake. In another 1.5 miles is the Fouch Road Trailhead on County Road 614. 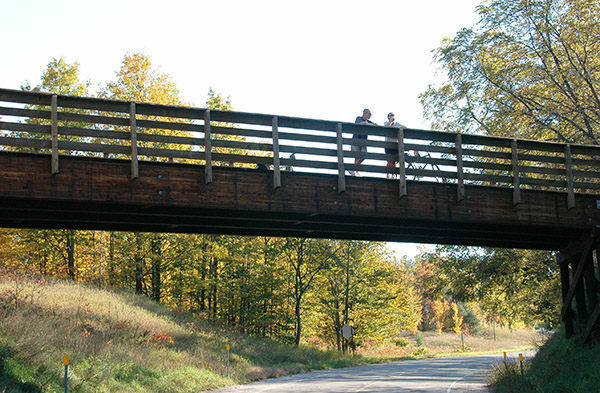 The Leelanau Trail immediately crosses CR-641, passes Milepost 6 and enters the rural heart of Leelanau County. 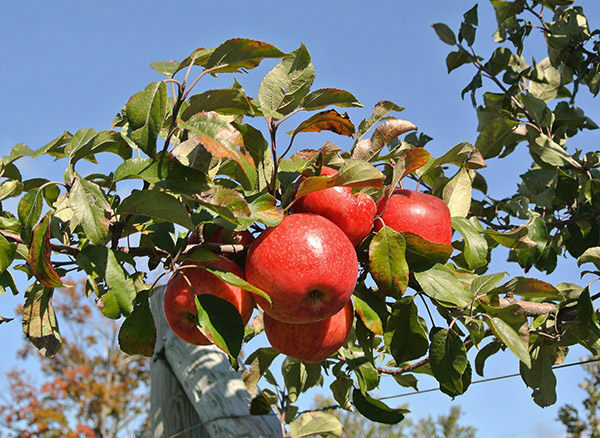 Bikers ride past cherry orchards, apple trees and corn fields, often separated by small woodlots, enjoying the best feature of rail-trails, a lack of steep topography. There are two noticeable changes in elevation along the trail, but both are gentle downhills while heading north. The first is near Bingham, the halfway point of the ride, where the trail utilizes a classic railroad trestle to cross Center Highway just before Milepost 10. Beyond it is a raised rail bed, with rolling orchards and pastures on each side of you, as the trail descends for a half mile into a forest of young maples and beeches. Just beyond Milepost 11, you cross Shady Lane, where you can take a detour for a third of a mile to the east to visit the tasting room of Shady Lane Cellars, one of a half-dozen vineyards near the trail. The Leelanau Trail crosses Center Highway a second time before Milepost 13 where there again is an opportunity to depart briefly and visit up to four vineyards. The closest is L. Mawby, less than a half mile away on Elm Valley Road. A half mile beyond Milepost 14 you cross Revold Road and begin the second descent of the day, a stretch where the pedaling is easy and the views are the most extensive of the ride. For more than 2 miles you gently coast downhill until bottoming out at CR-622. On the other side of the street is a level stretch of trail that leads into the heart of Suttons Bay. The 4th Street trailhead and Milepost 17 is reached within a third of a mile. A block beyond that, on the corner of 1st Street and Cedar Street, is the Leelanau Trail Kiosk, with information, a bench and bicycle racks. From the kiosk, Suttons Bay’s shops, cafes, ice cream parlors and its beach on Grand Traverse Bay are a short walk away. The BATA bus stop is across the street at Leelanau Studios, 10781 E Cherry Bend Rd., or a third of a mile west of M-22. To reach the rest of the Leelanau Trail, head west on 1st Street for a block and then north (right) on Marys Street. Within three blocks, turn east (right) on Jefferson Street and follow it to the corner of Front Street and Adams Street where the Leelanau Trail resumes by winding around the Suttons Bay Library. The Cherry Bend Road trailhead has parking for a dozen cars, with the lot often full on summer weekends. There is an information kiosk at the trailhead but no toilets or drinking water. During the summer months, there are portable toilets at the DeYoung Natural Area and public restrooms at the Suttons Bay Marina. The restrooms at Inland Seas Education Association, located across M-22 next to Boone’s Restaurant, are available to trail users year-round when the office is open Monday through Friday from 9 a.m. to 5 p.m. There are no fees for using the Leelanau Trail but there are donation pipes. Please give. In the winter, TART volunteers groom it from the Cherry Bend trailhead north to Birch Point and from 4th Street in Suttons Bay south to Revold Road for both classic and skate skiing. Mileposts along the Leelanau Trail begin with Mile 0 on the TART Trail in Clinch Park, Traverse City’s waterfront park overlooking West Grand Traverse Bay. Major trailheads for the Leelanau Trail where you can park a vehicle are located at Cherry Bend Road (Milepost 3), Fouch Road (just before Milepost 6), and 4th Street just west of M-22 in Suttons Bay (Milepost 17). You can also park and pick up the trail at the DeYoung Natural Area on Cherry Bend Road (near Milepost 4) 2 miles from M-22 and near the Keswick Methodist Church, on Center Highway between Fort and Revold Roads (Milepost 14). 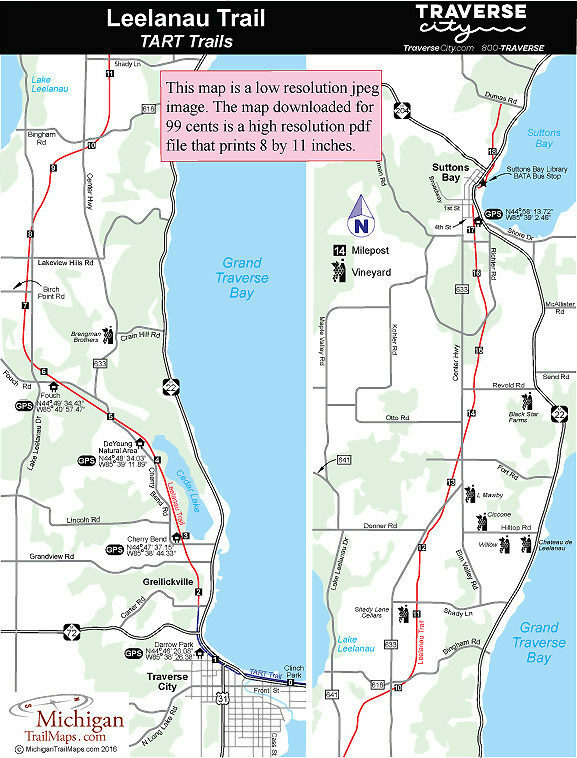 The Bay Area Transportation Authority (BATA) Bike-N-Ride program allows you to pedal the Leelanau Trail one-way and ride the bus back in either direction to your starting point. Weekday service is offered from late June to Labor Day, with the every-other-hour Bike-n-Ride beginning at the Hall Street Transfer Station at 5:30 a.m. and ending at 6:30 p.m. More limited weekend service is available from late May to late October. In Suttons Bay, the BATA stop is at the Suttons Bay Library on Front Street. Bikes are transported as part of a regular $3 fare that is paid on the bus in cash or with a BATA FlashFare card. It’s first-come-first-serve so on the weekends during the height of the tourist season it’s wise to get to the stops early. For a complete list of stops and times, contact BATA (231-941-2324; bata.net/bikenride). For more information or cycling events staged on the Leelanau Trail, contact TART Trails (231-941-4300).